Tomato Soup recipe. Its chunky, perfect to dip in your crusty bread or breadsticks. It is vegan, gluten free, easy to make, tasty & delicious too. Everyone loves a good homemade soup. And if that’s a tomato soup, it always manage to bring in good old memories of childhood. 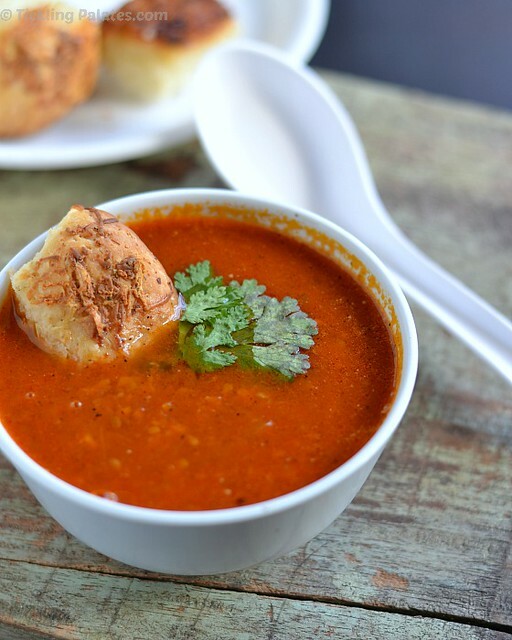 Being a south indian, growing up, we were not into soups big time. 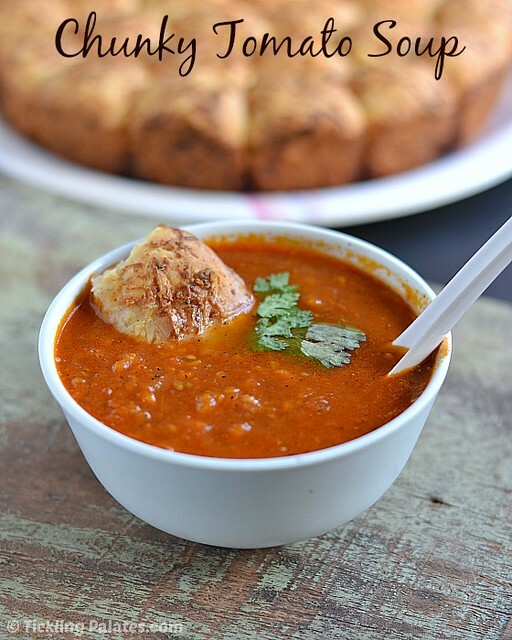 The only thing that my Amma used to make is this tomato soup whenever we used to pester her to make a soup during Winter. I made this soup last weekend to go with these Cheesy garlic pull apart rolls for dinner and oh boy, the combo was a match made in heaven. Just pull apart the roll and further pull it apart into small pieces and drop them into the soup, so that they could absorb some of the broth and eat it along with the soup. Trust me its heaven on any cold night and will soon become your comfort food at any time of the day. I’ve never had a fancy for clear soups and always prefer a soup that has more body, texture and volume to it and be filling at the same time like any other one pot meal does. 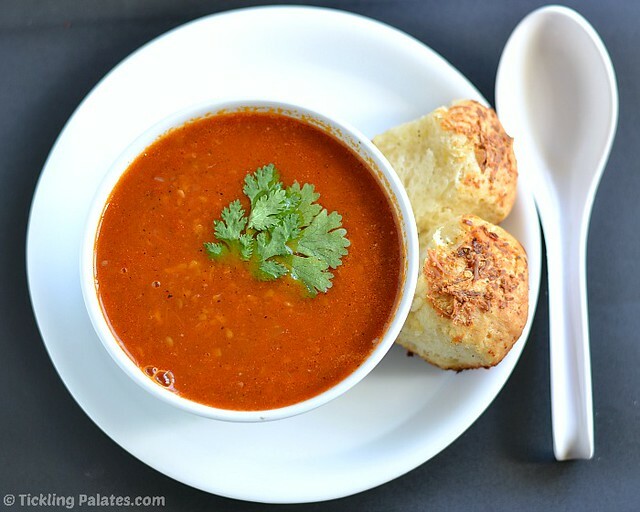 Tomato soup is the most versatile of soup recipes and it can be made in many different ways, but I make it this way as my kids also prefer this version of tomato soup. Basically if you use vegetable broth to make this soup, it will enhance the taste of the soup but if you do not happen to have any homemade stock at hand, you can use store bought soup cube instead. But since my kiddo has been restricted to things that are with high sodium content, I always make this soup whenever I make vegetable stock at home. If you do not happen to have both vegetable stock and Italian seasoning on hand, use a vegetarian bouillon cube (soup cube). Crumble the soup cube and add it to water. Use the hybrid variety of tomato and not the standard ones as they will be very tangy. If using soup cube, check the salt as the cube itself will have salt in it. Instead of carrots, you can also use a beetroot but it will give out a more intense earthy flavor than when compared to adding carrots. 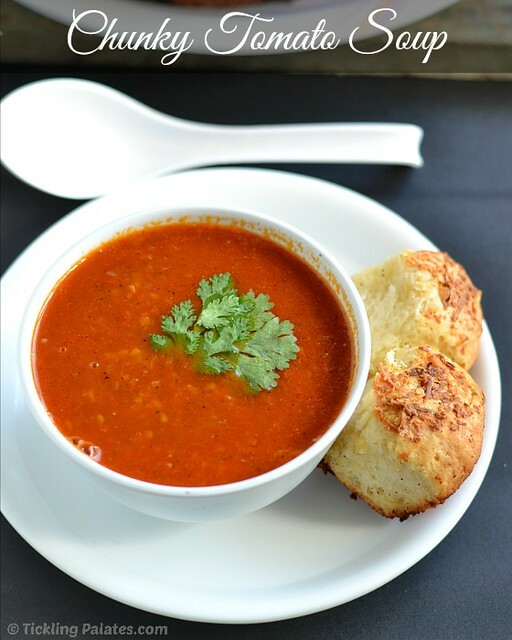 Classic Tomato Soup that's vegan & gluten free. Serve it with a crusty bread. Chop the onion and carrots into big chunks. Slice the garlic & set aside. Wash the tomatoes and make 2 slits in the form of X at the bottom of the tomatoes. Bring 3 cups of water to bubbling boil. Place the tomatoes in the hot water, close with a lid and let it be for 10 mins. After 10 mins take out the tomatoes and peel the skin off the tomatoes. I did this in the microwave. Once the tomatoes cool, chop them into big chunks. Heat a sauce pan with olive oil. Add garlic, onions, carrots and sauté for 2 mins. Add tomatoes and mix well. Add 4 cups water, salt, Italian seasoning, close with a lid and let it come to a boil over low flame. Let it cook for 5 more mins over low flame. Now gently scoop out the cooked vegetable chunks with a ladle and transfer it to a mixie jar. Pulse a few times at regular intervals. Do not grind it at one go and make into a puree or paste. There should still be vegetable chunks. If you have an immersion blender, you can pulse in the sauce pan itself. Now transfer the pulsed vegetable back to the broth, add sugar, black pepper and let the soup simmer for 5 more minutes. 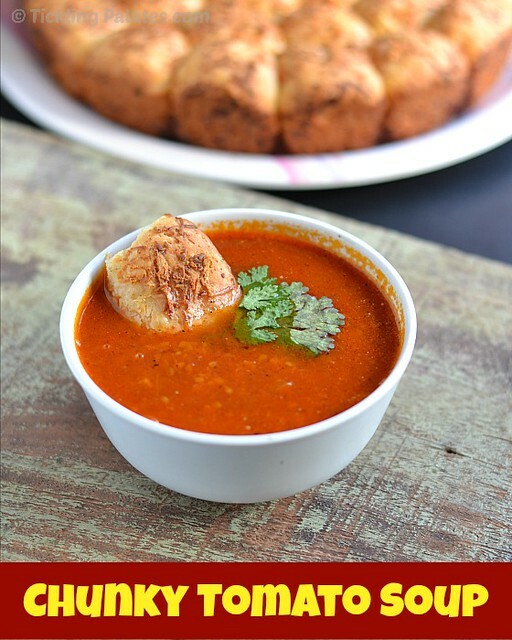 Garnish with coriander leaves or parsley and serve piping hot in individual soup bowls with croutons or garlic bread. Thank god there s a cream free version of tomato soup. Looks comforting, no actually heavenly with those rolls by the side. The soup looks and sounds good but that bread looks amazing. What bread is it? Loved this vibrant coloured tomato soup. Yummy and very perfect presentation. Soup looks delicious and comforting.. A healthy and refreshing meal with the bread..
Deliciosa sopa reconfortante se ve muy bella,abrazos y saludos.